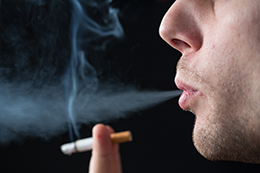 Tobacco use is the most preventable cause of head and neck cancer deaths. Even though most head and neck cancers are preventable, more than 55,000 Americans will develop cancer of the head and neck this year, and close to 13,000 of them will die. The numbers of lung cancers and deaths associated with smoking in the US are declining as more Americans quit smoking. But while lung cancers are decreasing, cancers in the head and neck are increasing because of the use of smokeless and spit tobaccos. Many head and neck cancers are curable when diagnosed and treated early. See our specialists at Cumberland Valley ENT for early detection if you recognize any of these early warning signs. It could save your life. Not all lumps are cancer, but a lump in the neck that lasts more than two weeks should be seen by one of our otolaryngologists (ENT specialists) at Cumberland Valley ENT as soon as possible. Hoarseness or a change in your voice that lasts longer that two weeks should be evaluated. One of the otolaryngologists at Cumberland Valley ENT can examine your vocal cords easily and painlessly. Most cancers of the mouth or tongue cause a persistent sore or swelling that may be painless or could bleed. Any lumps in the neck associated with a swelling or ulcer in the mouth should be evaluated as soon as possible by one of our head and neck specialists. Signs of blood are not always an indication of cancer, but if you see blood in your saliva or phlegm for more than a few days, Cumberland Valley ENT can rule out a tumor in the nose, mouth throat or lungs. If swallowing liquids or solid foods is a constant problem, you should be examined to rule out cancer of the throat or esophagus. Problems could be foods “sticking” or coming back up as you try to swallow. Make an appointment with us at Cumberland Valley ENT. It’s possible for constant pain in or near your ear when you swallow to indicate infection in the throat or tumor growth. If you also have a lump in your neck or experience hoarseness or difficulty swallowing, you should not delay an exam by one of our otolaryngologists. These combined symptoms may indicate a serious condition. Are You at High Risk of Head and Neck Cancer? You have control over many of the risk factors in your life. Prolonged exposure to specific risk factors account for up to 90% of head and neck cancers. Tobacco use in any form (cigarettes, cigars, chewing tobacco, or snuff) is the most common cause of cancers of the mouth, throat, tongue, and larynx. Alcohol consumption is also a major risk factor for cancers of the lips, mouth, throat and larynx. Prolonged exposure to sunlight is linked with cancer of the lip and has been established as a major cause of skin cancers. Play it safe. If you detect warning signs of head and neck cancer, contact us immediately. When discovered early, most cancers in the head and neck can be cured with few side effects. Any of the symptoms described above can occur without the presence of cancer, and in many instances, are due to some other condition. But an examination is necessary for a diagnosis. Request a consultation with one of our ENT specialists to be sure. Take a moment to think about your risk factors for head and neck cancers and contact us for an evaluation if you have any concerns. Contact Our Office to Schedule Your Visit Today! Send a secure message to our office and one of our experienced, reliable staff will respond. Hear what others are saying about their quality experience with Cumberland Valley ENT.